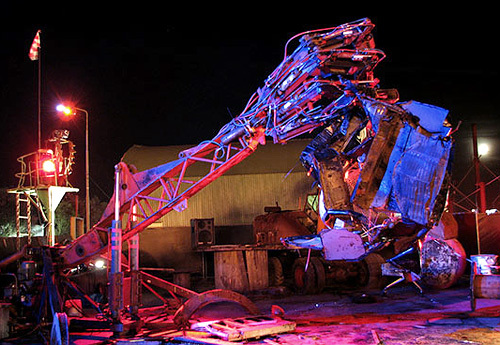 Gigantic Car Crushing Robot Hand | OhGizmo! The eventual takeover of mankind by machines comes one step closer with the creation of this giant robot hand. It was built by untrained volunteers for the Robodock festival in Amsterdam last month, and is actually capable of crushing everything from shopping carts to small vans. The hand itself is 25 feet long, weighs about 5,000 pounds and was built from scrapyard parts including I-beams for the fingers and a digging machine truss as the forearm. The hand is controlled by sticking your own hand into a custom control armature and moving it about. Understandably, given its size, weight and low-tech design the crushing hand moves very slow, but being able to lift a van 20 feet off the ground after reducing it to scrap metal has to be fun. If you’re curious, I’ve included a video after the jump that partly features the crushing hand in action about 30 seconds in. Unfortunately now that the festival is over the giant hand is probably destined to return to the scrap yard from once it came. While its creator would like to bring the robot hand back to the US, moving and shipping the giant creation is difficult and expensive. So if a local buyer can’t be found it will simply be destroyed, possibly by an even larger robotic hand, but don’t quote me on that.